2. what is the best way to adapt the fan on a UDS? i already have 4 holes around the base, would i need to make one of those holes a little bigger? 1 yeah man from what i could tell it should work great!!! Yep, that is the excat same one I used on my project, let me know if you have any questions about programing or wiring because it took me a while to figure that out. I also thought I would share on this thread the diagram that evil16v put together for me. It was very helpful on how to wire this exact PID for my situation. Hope it helps for you too! I'm trying to figure out if I can use the J1 alarm to turn a light on. The scenario is such that I want to cook, at say, 220 degrees. I'd like to set up the alarm to turn on a light at around 200 degrees to help indicate that even though the fan is on, there isn't enough wood left in the firebox to get the temps up. I'm thinking that I need the alarm mode where AH<AL. My guess is that I could set the AH at 200 and AL at 201, correct? Power up the controller. Keep pressing (>) to activate auto-tuning. When �AT� stop blinking, new PID parameters are generated for the new system. The controller is in normal operation mode controlling the pit temperature at 220 deg f.
Here's my assembled controller. The red light on the lower left is going to be used as a low-temp alarm that I will be able to see from a distance. The intent is that when the cooker is out of wood and the fan can no longer keep the heat at my desired setting I can see the light and know to add more wood. I still need to hook up the fan but I tested the socket with a DVM to see that I was getting 12 v. output when the AL2 light is on. The final item is to figure out how the get the fan attached to the firebox so that the fan airflow is directed into the box but the fan not get melted. Hi Could someone please advise if this pid controller would be ok to use? From what I could find by searching around the web, my (non-expert) guess is that it would work just fine. The documentation looked very similar to what mine had as far as output types and programming options. So do I only need a power unit if I am using a Pc fan? UK Reserve Grand Champions 2010. Pro Q Excel and Frontier. Proudly sponsored by Maverick and Fab. If I'm looking at the correct controller, the specs say it'll take 85V~260VAC / 85V~360VDC (<2w). Without knowing the voltage that your PC fans requires, it's tough to say but if the PC fans are similar to ours, the fan takes 12v. So unless you install some voltage regulator/bridge to lower 85v to 12v, I can't think that it would work. I'm plugging in 2 offsets (fully modded CG outlaws) and 2 barrel grills (CG Smokin Pros). I would prefer to stay with 12v and not need to fire up an inverter (I'm on battery power). I like the low temp light posted above. I need to keep it all clean because I'm building a show-off toy. What PIDs and blowers and dimmer switch should I use? Also, I think I want my temp senser mounted on lid. I don't want a wire down with the food except for the food probe. suggestions? I guess I don't quite understand the configuration that you're looking for. Four separate boxes? One box with 4 PIDs? etc. The picture of mine above is encased in a 4"x4"x4" box and the fit is relatively tight but since you won't have an A/C input plus won't have an A/C-D/C converter, you should be plenty of room. Assuming battery power, there are several PIDs listed throughout this thread that run on 12v. Match it up with a 12v. fan and you're golden. On the box of mine shown in the pic above, the thermo connection is on the lid (that's the one plugged in in the picture) and the other lid connection is for the fan. It's really quite easy to put one of these things together once you get the parts all gathered up. It wasn't the exact manual for the controller that I used. The manual for the one I used had less detail. This manual worked with the only differences being a few less programming options being found on my controller but for the configuration needed for a cooker, they are not needed anyway. thanks. I will be doing 4 at the same time with a central control box so screw-ups will be costly. I will be leaning on you guys who already did it during all my purchases. 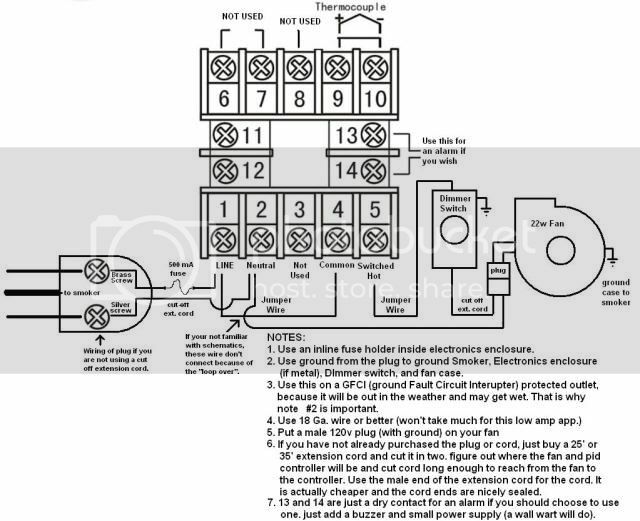 I definately want some kind of dimmer control and need to configure it so normal rain will stay out of the fan if it rains while the fans are mounted. My plan is to have the control box on curb side and have 5 car temp gauges strategically placed so that from both sides and the back of the trailer, you can see all 4 temps. This looks great. 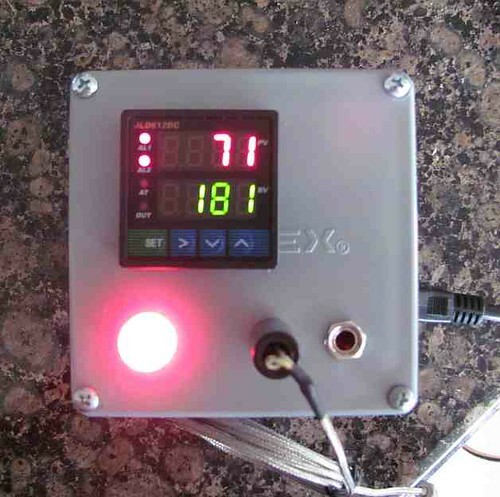 I use a cheap aquarium temp controller to power a heat strip / freezer to control fermentation. I've been wanting to do something like this for my char-griller trio. Even thought of doing AC output to convert my gas verticle to a hot plate. Question; when using this on an offset and the minion method is it still ok to stack the hot coals to the left? My firebox is on the right, cook chamber on the left. Was thinking if the unlit are to the left it would light them up quicker. Or am I over thinking this? 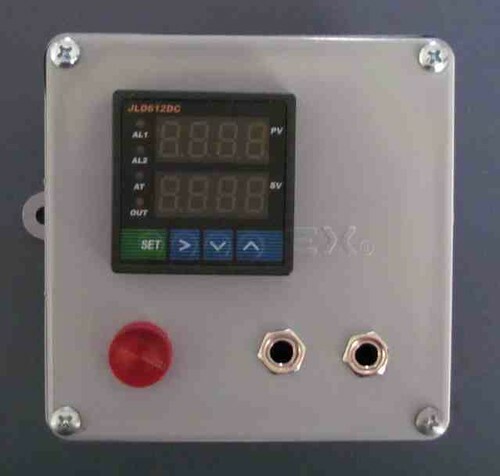 Can the PID control be set up to turn elec. burners on and off to control the temp? If so can you tell me wht to do? I have all the parts in your thread before I realized that it wasn't set up for an elec. cooker. Thanks for any help you can provide!!!! You may want to take a look at the manual that I linked to a couple of posts above. In the application example section, they show some stuff that might apply to your electric heater element.